Video of the protest at the White House including Ray McGovern 4 min 30 sec,on Liveleak after being removed by Archive.org. The 14th of May marked the opening of Trump's new US Embassy to Israel in Jerusalem. When Palestinians tried to protest with a peaceful march to the Apartheid Wall, Israeli snipers and troops opened fire. Reports are that 58 protesters were killed and over 1,000 wounded. 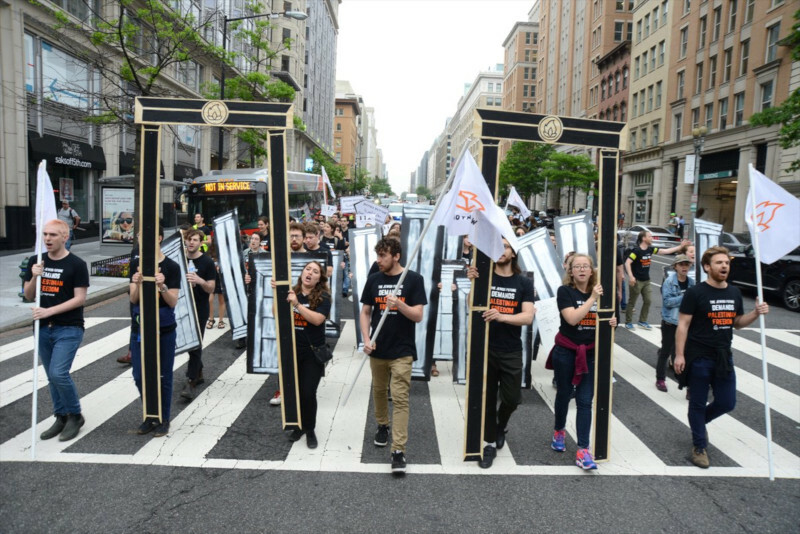 Here in DC, IfNotNow blocked Penn Ave in front of Trump Hotel and a second group protested in front of the White House against this outrage. 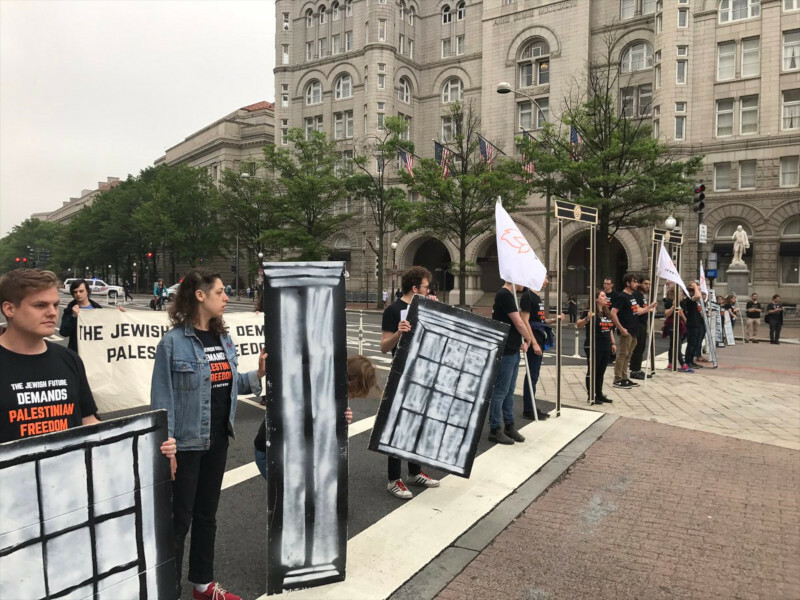 The first up of the DC protests was IfNotNow erecting their own "Embassy of Freedom" right in front of Trump Hotel on Penn Ave, totally shutting down the street during the AM rush hour. 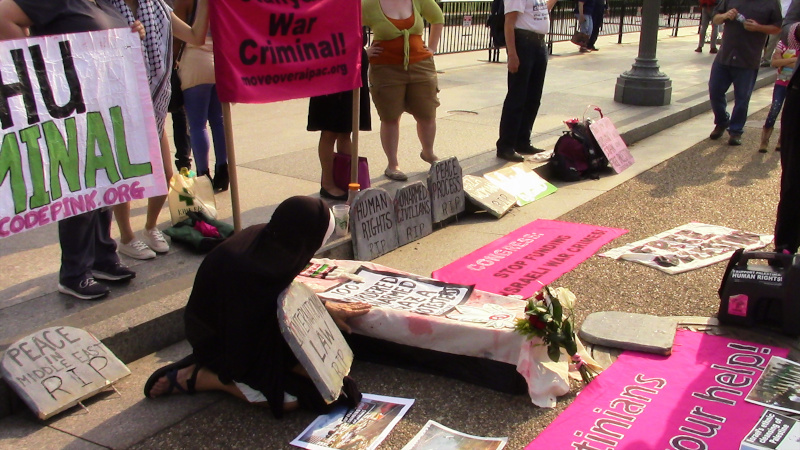 Later in the day, protesters, many who had been busy at the US Capitol with the Poor People's Campaign showed up at the White House with picket signs, a casket, flowers, and mock tombstones. 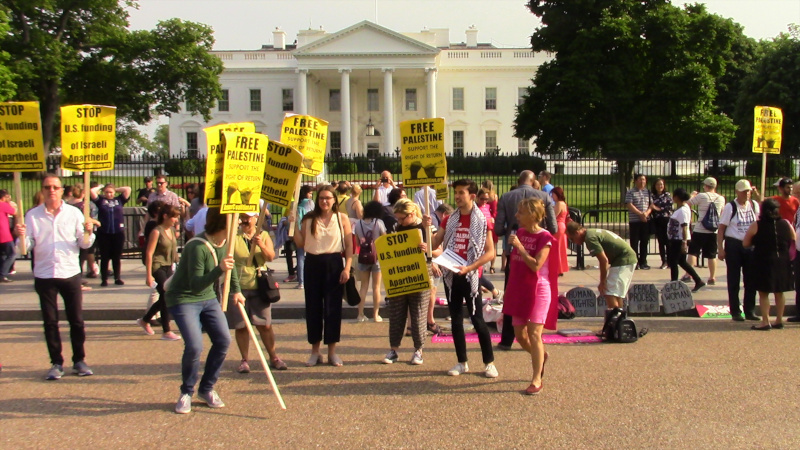 The keynote speaker in front of the White House was George McGovern, whose hands and wrists were injured and his arm dislocated by police when he protested on May 9 at torturer Gina Haspell's confirmation hearing as CIA director. Bruises were still clearly visible on his arms from this brazen (though at least not lethal) police brutality. Israel's choice to brazenly shoot down peaceful protesters at the Gaza Wall is no doubt what Donald Trump really wanted to do when protesters opposed his Inauguration. Thus, the near certainty that moving the US Embassy to Jerusalem would lead to protests, and the likelihood that Israel would use armed force to stop the protests were no deterrent to Trump's choice to move the Embassy. During his campaign for office, Donald Trump called on his supporters to beat up protesters, and once said "remember the time when people used to go out on a stretcher." While he was unable order the National Guard to open fire on Inauguration protesters, he no doubt is responsible through his Attorney General Jeff Sessions for the extreme charges filed against originally over 200 protesters arrested on J20, with 58 people still facing decades in prison and four on trial right now. Given these factors it should be assumed that the Israeli snipers who killed 52 protesters at the Gaza Wall on May 14th did so with the full blessing and support of the government of the United Snakes of AmeriKKKa. The blood of these protesters is on Trump's hands. Coffins and tombstones symbolize 52 protesters shot and killed by Israeli snipers as the US Embassy moved to Jerusalem. More have been killed in prior protests.